If you’re concerned about limiting your carbon footprint, then the Greenworks 21052 is an ideal lawn trimmer/edger purchase. The pivoting head allows for great maneuverability and control, and it packs in a surprising amount of power for an electric model. We were impressed with the automatic line feed and how it replaces worn line as needed. 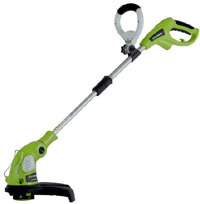 The lawn trimmer’s blades have a 13-15” cutting width, which makes short work of large lawns. At a reasonable price of $39.94, this Greenworks weed eater does its job efficiently.